Under its reorganization planned approved today, Visteon's bondholders will put up around $1.3 billion to buy control in the reorganized company. The dozens of bondholders include Goldman, Sachs & Co. and hedge funds such as Oak Hill Advisors and Silver Point Capital. WILMINGTON, Del. (Reuters) -- Visteon Corp. received court approval on Tuesday for its bankruptcy reorganization, ending a 15-month fight among hedge funds, lenders and an industry giant for a piece of the revived auto parts maker. Visteon overcame objections about the treatment of retiree benefits and the way big-money shareholders, but not individual shareholders, were given the right to buy stock in the reorganized company. 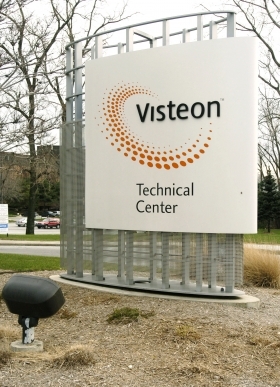 U.S. Bankruptcy Judge Christopher S. Sontchi approved Visteon's reorganization plan after the auto supplier reached an agreement with retirees. Sontchi also approved Visteon's request to borrow as much as $700 million. Visteon retirees had sought to preserve their health benefits after the company exits bankruptcy. But the agreement clears the way for the company to cut the benefits. The company also agreed to pay $12 million to unions representing more than 6,000 former Visteon workers, Bloomberg News reported. Visteon, a former Ford Motor Co. unit that makes air conditioning and electronics systems, will exit bankruptcy under the control of bondholders, who were owed about $870 million. Bondholders will put up around $1.3 billion to buy control in the reorganized company. The dozens of bondholders include Goldman, Sachs & Co. and hedge funds such as Oak Hill Advisors and Silver Point Capital. Under the reorganization, lenders who were owed about $1.6 billion will be paid in full. Shareholders could end up with as much as 5 percent of the stock in the post-bankruptcy Visteon. The plan will become effective and Visteon will emerge from Chapter 11 upon the completion of necessary closing conditions, which Visteon expects to occur by Oct. 1. "The difficult and necessary actions undertaken during this reorganization will allow Visteon to emerge as an extremely competitive automotive supplier," Visteon chairman and CEO Donald J. Stebbins said in a statement. "Upon consummation of the reorganization plan, we will have dramatically realigned our capital structure," Stebbins said. "Our substantially reduced debt level, in combination with the extensive operational restructuring we executed over the last several years, positions Visteon for long-term growth and profitability."